Ever stopped to really think about what flour is? Ever think about why a recipe calls for all-purpose flour vs. pastry flour or some other form? Ever wonder whether you should be making a greater effort to substitute whole wheat flour for white flour and if you would notice the difference? I always do, and I figured it was time to sit down and do some research (occasionally the bug to find out "everything" gets me -- in the past I've done this on eggs and on refrigeration and food safety). I compiled a list of my top questions and surfed the web for the answers with the help of my friend, Alison. As with my other deep-dive posts, this post is a compilation of information found on the web – most of it extracted verbatim. For this one, we used www.marthastewart.com, flour.com, the North American Miller’s Association, Wikipedia, Cooking for Engineers, www.flour.com, U.S. whole grains blog, and The Cook's Thesaurus. What is flour and where does it come from? According to Wikipedia, “flour is a fine powder made by grinding cereals or other edible starchy plant seeds suitable for grinding. It is most commonly made from wheat—the word 'flour' used without qualification implies wheat flour—but also maize (now called corn in many parts of the Western Hemisphere), rye, barley, and rice, amongst many other grasses and non-grain plants (including buckwheat, grain amaranths and many Australian species of acacia). Ground legumes and nuts, such as soy, peanuts, almonds, and other tree nuts, are also called flours. The same substances ground more coarsely are called 'meal' instead of 'flour'.” For the purposes of this post, “wheat flour” will refer to all flours made from wheat. Wheat flour is one of the most important food ingredients in Europe and America and is the product obtained by grinding wheat kernels or “berries.” What kernels are the seeds of the wheat plant and are the only part of the plant that is milled into flour. 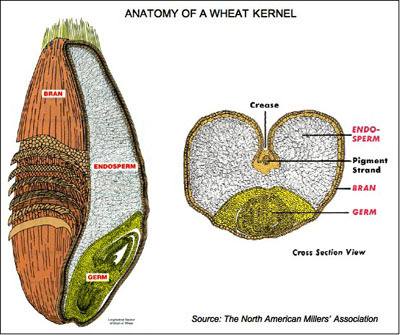 The kernel consists of three distinct parts: bran (the outer covering of the grain) germ (the embryo contained inside the kernel) and endosperm (the part of the kernel that makes white flour, and the largest part of the kernel). During milling, these three parts are separated and recombined to achieve different types of flours. (As a side note, wheat flour is highly explosive when airborne and candles, lamps, or other sources of fire were forbidden in medieval flour mills). What types of wheat flours exist? Wheat has two main growing cycles, Spring and Winter. These cycles, along with the geographic region and soil content where it is planted, produce soft and hard wheat, or wheat with a high starch content or high gluten content, different hardnesses and colors. All of these factors are used to classify and describe wheat. The amount of, gluten protein is what gives wheat flour its baking qualities. The harder the wheat, the higher the protein content in the flour. Soft, low protein wheats are used in cakes, pastries, cookies and crackers. Hard, high protein wheats are used in breads and quick breads. Durum is used in pasta and egg noodles. Flour can be “white” (comprised of the endosperm), whole wheat (made by grinding the kernel or recombining the white flour, germ and bran that have been separate during milling), or germ flour, made from the endosperm and germ, excluding the bran. There are over 200 varieties of wheat produced in North America alone. Made from a high-protein, hard wheat. It is usually enriched and used to make pasta products. Semolina is the coarsely ground endosperm of durum. Also called stone-ground or graham flour, whole wheat flour is milled from the whole grain. It contains all of the bran and germ from the wheat berry. Whole-wheat flours produce heavier and denser baked goods and are often combined with white flour in making breads and muffins. Most whole wheat flours are made out of a hard red wheat, but hard white wheat (a white wheat berry is "whiter in appearance" than a red wheat berry) is gaining in popularity due to its lighter appearance and naturally sweeter taste. Because it contains the germ and bran, whole wheat retains vital nutrients. Whole what flour needs to be used fresh, and stored properly as it gets rancid quickly due to the high fat content from the wheat germ. Typical protein levels range from 11.5 to 14.0% and most whole wheat flours are enriched. Bread flour is milled primarily for commercial bakers, but is available at most grocery stores. The flour is usually made with a greater percentage of hard red winter or hard red spring wheat, giving it a higher gluten content. This gives the bread dough the elastic quality necessary for greater product volume. Protein levels vary from 10.5 to 12.0% (note: some other sources say 12 to 14%). Common applications include breads, pizza crusts and specialty baked goods. White flour milled from hard wheats or a blend of hard and soft wheats. It is used in some yeast breads, quick breads, cakes, cookies, pastries and noodles. Different brands will vary in performance. Protein varies from 8 to 11 %. This flour is primarily used for cookies and pastries. It comes from soft winter wheat, and is very starchy. Pastry flour has properties between those of all-purpose and cake flours. It is usually milled from soft wheat for pastry-making, but can be used for cookies, cakes, crackers and similar products. Pastry flour differs from hard wheat flour in that it has a finer texture and lighter consistency. It has low protein content (typically 8.5 to 10%) and produces pies and pastries with a flaky or tender consistency. Fine-textured, silky flour milled from soft winter wheat. It is used to make cakes, cookies, crackers, quick breads and some types of pastry. It has a low gluten content, and produces cakes with a tender crumb. Protein content is typically 8.5 to 10% and the flour is enriched. Also referred to as phosphated flour, is a convenience product made by adding salt and leavening to all-purpose flour. It is commonly used in biscuits and quick breads, but is not recommended for yeast breads. One cup of self-rising flour contains 1 ½ teaspoons baking powder and ½ teaspoon salt. Protein levels run from 9.5 to 11.5% and the flour is enriched. The highest gluten content of all of the wheat flours used for baking. Gluten flour is usually milled from spring wheat and has a high protein (40-45 percent), low-starch content and a gluten content from 12 to 13%. This flour is used for dough needing extra strength and elasticity such as pizza, focaccia, mullet-grain breads and Kaiser rolls. Note: outside the U.S. you will often see flours labeled by a number that represents different mineral contents or “ash mass” that remain after incineration in a laboratory. This is another way of describing the fraction of the whole grain that remains in the flour. How should flour be stored? Flour should be stored in an airtight container in a cool, dry place (less than 60% humidity). All-purpose, bread and cake flour will keep for 6 months to a year at 70°F and 2 years at 40°F (note to self: uh oh); store away from foods with strong odors. Whole wheat flour should be refrigerated or frozen, if possible. Before using refrigerated or frozen flour, allow it to warm to room temperature and inspect for rancidity and taste. According to Martha Stewart, adding a bay leaf to the flour jar is said to help keep weevils out! What are the nutritional benefits of flour and how do the health benefits of white and wheat flours compare? Wheat flour is an excellent source of complex carbohydrates. Other than gluten flour, all types of wheat flour derive at least 80 percent of their calories from carbohydrates. Depending on the flour type, the percent of calories from protein ranges from 9 to 15 percent, except from gluten, which has 45 percent protein content. Calories from fat are never more than 5 percent. As the protein content of the flour increases, carbohydrate decreases. The mineral content varies with the grade, with lower grades generally showing higher mineral or ash values. Whole wheat flour is higher in protein than white flour milled from the same wheat. Because whole wheat flour contains the bran, the germ, and the endosperm (vs. white flour which just contains the bran), whole wheat flour benefits from the most nutrient-dense portions of what and contains the greatest nutritional benefits. The germ is packed with antioxidants, B vitamins and vitamin E. It is also a source of heart healthy unsaturated fats. The endosperm contains complex carbohydrates and protein. Whole wheat flour is higher in protein than white flour milled from the same wheat and it also contains dietary fiber, unlike white flours. Some people suffer from intolerance to gluten known as coeliac or celiac disease. Increased awareness of this disorder, as well as a rising belief in the benefits of a gluten-free diet, has led to increased demand for bread, pasta, and other products made with flours that are gluten-free. The process of refining flour to make white flour often results in the destruction of some of the vitamins and minerals in the flour. Almost all the flour sold is steel ground (crushed and ground by a large machine with steel hammers or rollers). This is an efficient process but the heat generated by the high grinding speed destroys some of the vitamins and nutrients in the wheat. In this case, nutrients are often added back to replace those lost (in fact, this is mandated by the government in some countries). These nutrients often include iron and four B-vitamins (thiamine, niacin, riboflavin and folic acid) and sometimes calcium. Flour is called “enriched” when these nutrients are added back. Some people interested in preserving the natural nutrients contained in wheat and in the taste and texture benefits associated with grinding one’s own wheat use kitchen mills to produce their own flour (may seem a little excessive but I hear that pancakes made with your own ground buckwheat are fabulous!). There are many home models on the market. These models use stainless steel blades instead of stones. Flour ground from the cereal grass grain rye. It is grown in the northern part of the United States, Canada, Eastern Europe and Russia. It has a very low gluten content (less than 2%) and is usually blended with wheat flour to produce a lighter loaf. In artisan baking, rye flour is fermented and makes very acceptable loaves. The flat breads of Scandinavia are produced from rye flours. Flour ground from another cereal grass. It is used in combination with wheat flours to produce tasty breads with excellent keeping qualities, and the bran from oat flour has been found to lower cholesterol. Flour derived from the soybean seeds. Soy flour has very little starch, but is extremely high in protein. It is considered a complete protein for the human diet. It is used only as supplement to breads to increase the nutritional protein as it is low in gluten. Can I substitute different flours in a recipe (general baking)? Instead of 1 cup. . .
You can use . . .
To create a lighter whole-wheat loaf, add 1-tablespoon gluten flour and 1-tablespoon liquid for each cup of whole-wheat flour. 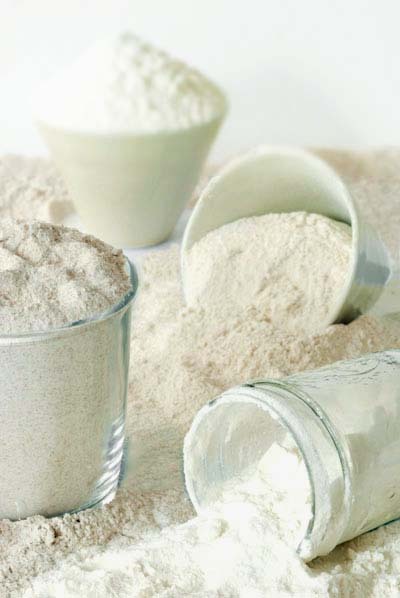 Flours can be bleached or unbleached. Bleached flours produce doughs that are less sticky, more uniformly white, more consistent, and rise better than unbleached flours. Bleaching can be accomplished by aging the flour over time (the oxidation of the flour causes the yellow pigments to fade) or through a chemical means (note: no change occurs in the nutritional value of the flour and no harmful chemical residues remain when flours are bleached chemically). Unbleached flour is aged and bleached naturally by oxygen in the air. It is more golden in color and generally preferred for yeast breads because bleaching affects gluten strength. Flours can also be fortified with nutrients not naturally present in the unprocessed raw material. The texture of the flour is determined by how much sifting (or bolting) is performed at the mill. The degree of sifting will result in powdery flour or coarse flour. Prior to packaging, most flours in the United States are also pre-sifted. Pre-sifted flour can be measured directly from the bag by stirring, measuring with a dry measuring cup, and leveled with a straight edge. Unsifted flour needs to be sifted prior to measuring (by volume). If unsifted flour is measured by weight, it should still be sifted prior to use in a recipe requiring sifted flour (assume all recipes require sifted flour). What a compelling photograph! And a comprehensive study of flour I know I'll return to for reference. Thanks for sharing. What an informative post - a definite keeper for reference. And that photo is wonderful! I'll certainly use the substitution table. thanks. We used bay leaves in all grain products when I sailed across the Atlantic in a small sail boat. If we'd gotten the moths, we'd have been out of luck. No shopping for replacement on the ocean. It works. Thanks for your feedback. Great to know bay leaves work. I must say, I'm not sure what a weevil is or where they come from but I know they are not good! Loved your picture at the top of the post. Just wanted to say that I grind my own flour all the time. I have the white wheat and hard red winter wheat. We love the flavor of the whole wheat. My ww pancakes are delicious, if I say so myself. They stay with you too, unlike pancakes using white flour. Thanks for your comment. I'll bet your ww pancakes are great (and I bet they'd make me feel less guilty for eating them). I'm curious to try grinding my own! When you're baking no matter the weather. Good & healthy - no arteries to clog! An interesting post. I learned some new things. :) That photograph is perfect - absolutely beautiful! Great post and great photo. It is good to see such detail and the explanations are really well done. Here in Australia we don't have cookie, pastry or cake flour - our "Plain Flour" is used for all of these. I now buy most of my flours from a shop called "Goodies and Grains". It stocks all sorts of great things, from teas to beans, often in bulk. Even recently I helped some people find Casava Flour! I had never heard of it myself. But I do get a huge variety of bread flours including different ryes. They are fabulous. Thanks again for your post. Really enjoyed it. Oh, I forgot to say that the bay leaves do work. I have used them all of my cooking life - strewn through the pantry shelves and in the "high risk" items like flour, semolina, polenta etc. Works very well. Thanks M for the photo compliment! I know that is hard to earn! Thanks vegeyum for your notes and insight into what you use abroad. Interesting post! As a former science-type-turned journalist, I love this kind of stuff. Btw, I just came across your blog (started one a few months ago myself) and I think it's great! Fascinating!! Thank you for this- it will be an excellent reference in the future.